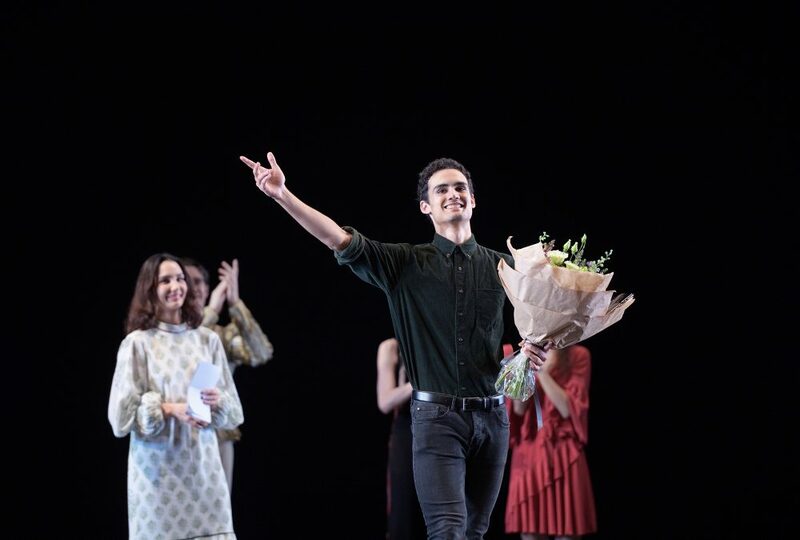 Daniel McCormick was announced as winner of English National Ballet’s 2018 Emerging Dancer Award last night. Having performed a pas de deux from Le Corsaire, with partner Francesca Velicu, and Leatherwing Bat, a solo by Trey McIntyre, Artistic Director of English National Ballet, Tamara Rojo, announced his win on stage at the London Coliseum, which was livestreamed to audiences across the world. Winning this award was completely unexpected, my colleagues on stage with me tonight are so immensely talented. It’s a dream to perform on the stage of the London Coliseum – a place with such history and beauty – and it’s an honour to come to London and perform for this fantastic audience. I’m now ready to work harder than ever to prove why I won this prize. The evening also saw Georgia Bould named as the recipient of the Corps de Ballet Award, acknowledging her exceptional work over the last year, while Alice Bellini was awarded the People’s Choice Award, as voted for by members of the public. Emerging Dancer allows English National Ballet to recognise the excellence of its artists. Rojo was joined on the judging panel by Julio Bocca, Lauren Cuthbertson, Johan Kobborg and Kerry Nicholls. It’s wonderful to have Emerging Dancer as a platform to celebrate the talent of English National Ballet’s young dancers. The standard we saw on stage tonight has been extraordinary. It was incredibly hard to pick a winner but the judges felt that Daniel had that little bit extra. He’s special, he has a hunger to continue to learn, an openness to all the different styles English National Ballet has, and such courage as a young dancer to put himself out there. The other finalists this year were Precious Adams, Fernando Carratalá Coloma, Francesca Velicu, Connie Vowles and Giorgio Garrett. Previous winners of the Emerging Dancer Award include Shiori Kase (2011), and Junor Souza (2014), who have since been promoted to Principal and First Soloist respectively, Alison Mcwhinney (2014) who went on to be promoted to First Soloist, and last year’s joint winners, Aitor Arrieta and Rina Kanehara who have been promoted to Soloist and Junior Soloist respectively.